A character played by Patrick Bohnet in the campaign A Bride for Merlin. a son, Damos (dead for many years; was married to Xerra Sawall, now also dead; they had three children). a daughter, Alana, who is an independent (non-sponsored) candidate (to be Merlin's bride). 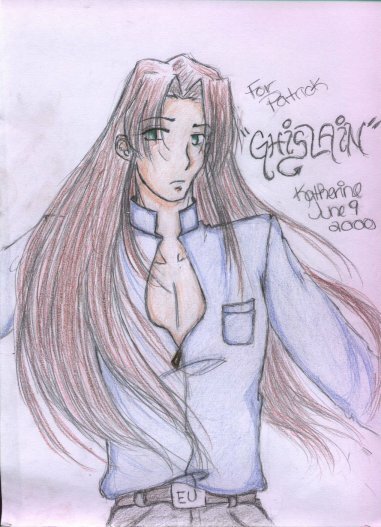 Ghislain (pronounced "jis-LAIN") is an accomplished artist, primarily as a painter. Malachai (pronounced "MAL-uh-KYE") is an accomplished painter, musician, and sorceror. Delana (pronounced "deh-LAH-nah") still practices the martial mannerisms (and prickly sense of honor) she learned as a child in House Hendrake. Robaird (pronounced "ro-BAIRD") dead some time ago. Ghislain is unaware of the exact circumstances of his brother's death, and his parents refuse to discuss the matter. He was known to be an excellent student of his father as well as of his grandfather (the late Baron, Lucien). Damien, Baron Vrell (pronounced "DAY-me-ehn") succeeded his father, Lucien, as the Baronial estate of Vrell (a shadow in the Black Zone). He can usually spare a moment or two in his busy schedule for his nephew, Ghislain. Alana Vrell nee Helgram (pronounced "ah-LAH-nah") is a sorceress. Ahriman (pronounced "AH-rih-man") is studying diligently under his father's tutelage, as befits the Baronial Heir. Lillias (pronounced "LIL-lee-ahs") is a candidate (to be Merlin's bride) of House Helgram. Nethozhen (pronounced "neh-THO-zhen", with the "zh" being pronounced just like the letter "s" is pronounced in the word "treasure") has been missing for many decades.